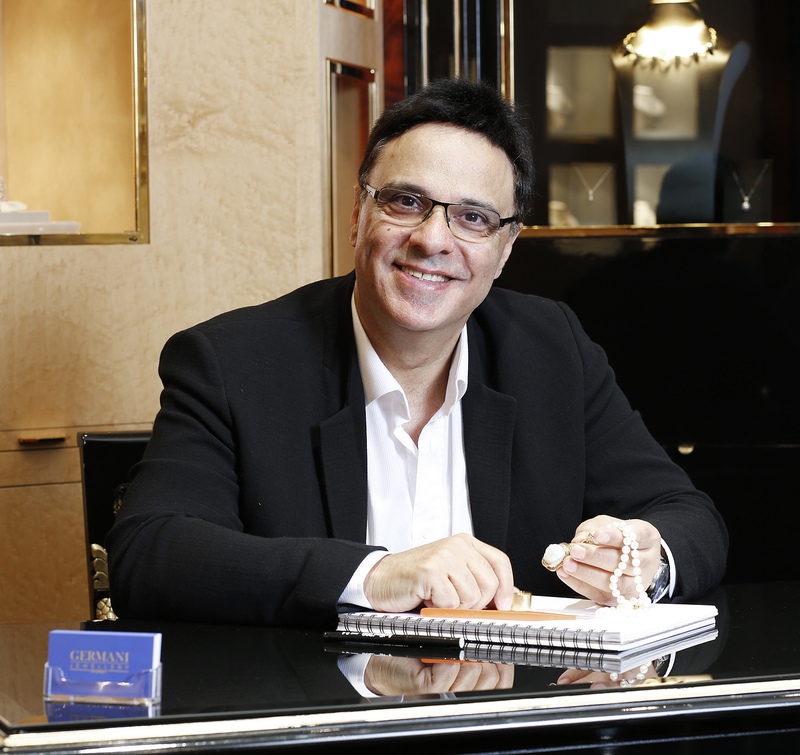 Michel Germani is the Founder and CEO of GERMANI Jewellery. Michel describes his personal style as embodying “I’art d’etre unique”. Accurately so, no other word but ‘unique’ as well describes the jewellery produced by this most cosmopolitan of designers. Michel Germani, is a graduate of celebrated Gemmological Institute of America in Los Angeles in 1980. He was previously based in Belgium, at the Diamond Bourse in Antwerp, and later worked in Switzerland for the Saudis prior to immigrating to Australia, where his main’s hallmark is producing exquisite jewellery designs to suit every customer. Michel’s unrivalled skill dates back to when he produced jewellery for prestigious customers such as the Royal Family of Saudi Arabia including a unique Diamond Necklace to Queen Noor of Jordan in 1984; An 18ct solid gold Brooch for the Duke and Duchess of Wellington commemorating the opening Skygarden in July 1987 in Sydney was handcrafted as a unique memento for this occasion. It was created based on the Castlereagh Street façade and was set with 41 round brilliant cut diamonds and six black opals from Lightning Ridge which was specially cut. The Duchess, needless to say, was delighted. Michel created a jewellery collection “RUBY, SAPPHIRE, EMERALD” for Elizabeth Taylor to launch with her Three Sparkling New Fragrances in 1994; The Rings and Perfumes were advertised on the National TV Show Sales of Century. Michel was first introduced to Princess Diana at the Victor Chang Cardiac Research Institute Dinner Dance in Sydney in 1996; Michel was honoured to design and manufacture a pair of Blue Sapphire and Diamond Earrings which were delivered to the Ritz Carlton Hotel in Double Bay where the Princess was residing. It is through the meticulous care taken by Germani and his staff in ensuring that every design is marked by Elegance, Beauty and Individuality that every piece of jewellery, reflects the quintessence of one’s personality.